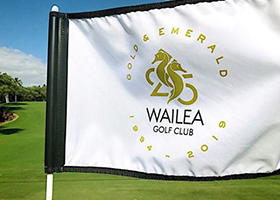 Rated one of the "best new courses" by Golf Magazine and Golf Digest, as well as "one of North America's most women-friendly" by Golf for Women, the Wailea Emerald is akin to a lush tropical playground. Flowers bloom in great abundance: plumeria, bird of paradise, allamanda, gazenia, bougainvillea, beach morning glory, "firecracker" plants and more. But don't be fooled by the Emerald's pleasant appearance. It is a superbly designed course created for pure golf enjoyment, regardless of one's handicap. Measuring 6,825 yards from the back, the Emerald features four to six tee boxes on every hole, allowing players to tailor the course to their playing level. Notable features include a large double green shared by holes #10 and #17. Fronting the green is the only lake on the course. This is perhaps one of the Emerald's more picturesque spots.